Lead up to the PAN AM GAMES in Toronto! I realize I have done a terrible job at keeping you all updated – but I will do my best to catch you up! To start off the 2014/2015 season my training group (The High Performance Centre of Ontario) moved out to the brand new Pan Am Pool at Morningside and the 401 in Scarborough. It’s an amazing facility so we’re all feeling really lucky to call that home. In December, I traveled to Doha, Qatar where I raced the 200m breaststroke and made it through to the finals. It was World championships short course metres (in the 25 metre pool) and I went a best time which was an awesome way to start off the season. Our biggest focus to date was Pan Am Games and World Championship trials, which happened the first weekend of April at my home pool (Scarborough). I qualified for both teams and swam the best time I’ve swam since the Olympics in 2012. After my race at trials, I looked up to the stands and had my family and some RBC co-workers cheering me on, which was great. 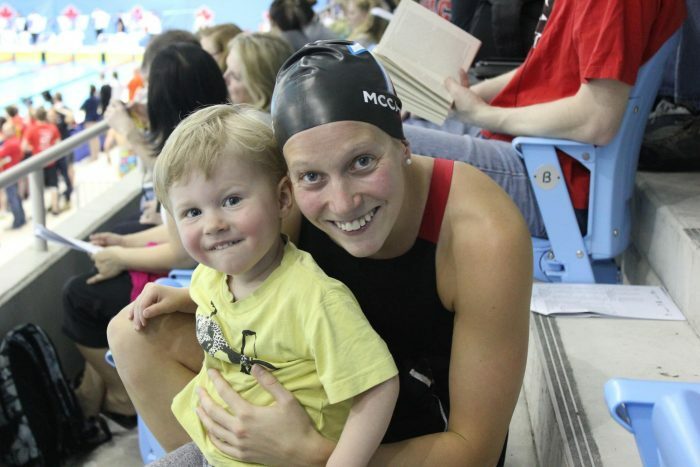 I couldn’t wipe the smile off my face when I saw my little nephew, Thomas, clapping and smiling at me down on pool deck (Photo of us after my race). I will be racing the 200 metre breaststroke at the Pan Am Games in Toronto on July 15th, 2015! Hopefully some of you can get tickets and make it out!!! My whole training group qualified for the Pan Am Games team, and my coach Ben Titley was named Head Coach of the Canadian Team. World Championships will be right after Pan Am Games and they will be in Kazan, Russia! Another exciting summer of racing and travels for me. I’ve been doing lots of talks to different businesses, and schools for the Pan Am Games so if anyone is interested in getting a little pump up before the games please send an e-mail along! It’s a really exciting time right now for all of us Canadian athletes. The opportunity we have this summer to race on home soil, in front a home crowd is going to be once in a life time experience and I can’t wait!!! Enjoy the sun wherever you are an keep an eye out for me on the CBC PanAm commercial, where I make a very brief appearance and comment!